We are all guilty of complacency in our belief that all is well with flexor tendon surgery and that our knowledge of this subject is complete. Like many other parts of hand surgery, when one looks a little more closely, one discovers that much that seemed fully understood is far from understood and what we have assumed to be based on hard fact often rests on opinion. Although, currently, there is debate about many details of technique, the central tenet of modern flexor tendon surgery is to repair and move divided flexor tendons within a few days of injury. This surgery should be performed under tourniquet control, so, requires adequate anaesthesia proximal to a tourniquet which will maintain the patient’s limb comfortable for a minimum of one hour for a single digit. This is longer than it takes to suture two flexor tendons but the exact extent of the injuries are not known before exploration. Draw a conversion of the skin wound into a modified Bruner incision to allow access. At the level of the injury, the Bruner incision may need to allow access to the neurovascular bundles to repair them. Proximally and/or distally, the incision only needs to allow access to the tendon sheath so the width of the points of the Bruner incision need be less and never extending out to the mid-lateral line. Open this skin marking adjacent to the skin wound only, extending it as necessary as the operation progresses rather than opening the whole length of the finger at the beginning. ascertain if the neurovascular bundles are cut. expose the wound of the tendon sheath. Widen the sheath wound slightly by excising 2–3 mm of the sheath to identify the precise injuries to the two tendons and whether the tendons have been cut in finger flexion or extension. The exact order of events to effect repair will depend on both of these factors. For the purpose of describing the various ‘tricks’ which are commonly used to facilitate repair, a division of both tendons at the commonest injury site, viz. just proximal to the PIP joint crease, is considered below. If the tendons have been cut in finger extension, the tendon ends will be visible, at, or in the vicinity of, the tendon sheath opening. The Bruner incision is opened by a small amount proximal and distal to the initial skin wound. Then, sufficient of the sheath is opened by longitudinal incision laterally on one, or two sides if necessary, from the sheath wound to allow tendon repair. Repair is carried out partly by delivering the cut tendon ends from the sheath and partly by opening the sheath, with the former increasing and the latter decreasing as the experience of the operator increases. The proximal tendon ends are first delivered into the opening in the sheath. The ends may appear in the sheath opening or sufficiently near to this opening to be held and pulled into the operative field with a small toothed forceps or arterial clamp gripping the centre (but never the sides) of the proximal tendon end. In other cases, the proximal tendons can be exposed by flexing the joints proximal to the tendon end and ‘milking’ the forearm flexor compartment from proximal to distal. If the tendon ends have still not been retrieved, it is reasonable to pass a small, curved artery clamp into the proximal sheath for 1–1.5 cm and try to grip the tendon end centrally. The confines of the sheath will not allow the clamp to open sufficiently to grip the circumference of the tendon. Repeating this manoeuvre more than once, or twice, with the proximal joints flexed and the forearm milked is rarely successful. If unsuccessful, open the palm with a 2 cm C-shaped incision at the level of the distal palmar crease in the line of the involved digit and identify the two flexor tendons just proximal to the beginning of the tendon sheath. Without pulling the tendons proximally and delivering their cut ends into the palmar wound, pass a fine sterile plastic medical tube up the sheath alongside the tendons to the wound in the finger, then suture the tube to the profundus tendon in the palm with a side-to-side suture and use the tube to pull the proximal tendon ends into the injury wound in the finger. When both tendons have been divided, if attention is directed at one of the two tendons, the other will also move distally because of their anatomical arrangement. As they are moved distally by pulling on the plastic tubing from the finger wound, the profundus tendon will also remain in its correct position between the two halves of the superficialis tendon. If only the profundus tendon has been divided, then care has to taken that the plastic tube and the profundus tendon pass through the chiasma of the superficialis, and not around it, during this manoeuvre. This can be done by visualising the chiasma from the finger wound as the tubing is passed distally. Deliver just more than 1 cm of the proximal tendon ends into the injury wound, and insert a core suture into the deepest tendon and then use this suture to maintain the distal hold on the tendon ends. As the superficialis tendon will lie behind the profundus at this level of injury, it is repaired first. Allow the tendons to drop back to the original position and remove the tube and suture used to deliver them from under the A2 pulley through the palmar wound. Occasionally, for proximal digital and palmar injuries, this same manoeuvre is necessary at the wrist to achieve retrieval of the proximal tendon ends from the carpal tunnel. Pulling the core sutures distally again from the injury wound, move the proximal ends until they are just within the operating field at the injury level but not fully delivered and occupying all of this, very limited space. Secure this proximal tendon position by passing a fine hypodermic needle transversely through the sheath and the tendons 1–1.5 cm proximal to the working area, making sure to lodge the sharp end of this needle safely in fat without injuring a neurovascular bundle, but so neither operator nor assistant suffers a needle-prick injury during the tendon repair. The distal tendon ends are then delivered into the wound by flexion of the interphalangeal joints and the second half of the superficialis core suture passed through the distal tendon end. This is easier if the proximal tendon ends have not been fully delivered into the wound. At this stage, the hypodermic needle holding the fixed position of the proximal tendon ends can be removed as the proximal tendons are now linked to the distal tendons and cannot drop back into the palm. Having removed the needle, the proximal end of the superficialis can now be moved distally to meet the distal end. A common problem of flexor tendon suture which makes the repair bulkier than the remainder of the tendon and which may impede gliding later is ‘bunching’ as a result of the core suture being too tight. This can be eliminated almost completely in every case by suture of the back wall of the circumferential suture at this stage, before knotting the core suture. The core suture is then tightened and knotted using the back wall suture line as an indicator of adequate core suture tension to prevent bunching. The front part of the superficialis circumferential suture is then completed. When the superficialis tendon has been divided slightly closer to its insertion, it is in two parts and each needs be sutured independently. Occasionally, each has sufficient substance to hold a core and a circumferential suture, inserted as described above, but often the tendon has thinned to a pair of thin flat ribbons which will not take a core suture. Horizontal mattress sutures of the gauge used for the circumferential suture, or one size larger, with the knots tied laterally outside the sheath are a practical alternative. The suturing procedure is then carried out for the profundus tendon. At this stage, it is necessary to ensure that the repairs, inevitably wider than the original tendon, will move through a full range of flexion without catching on edges of the adjacent pulleys. This is tested by passive movement of the finger. If the tendons have been cut in extension, the repair will only have to move proximally. It may be necessary to release, or ‘vent’, the sheath laterally at the distal edge of the pulley immediately proximal to the repair. With the injury just proximal to the PIP joint crease, this ‘venting’ involves loss of a small part of the total length of the A2 pulley. When the injury is in zone 1, this may require partial, or complete, venting of the A4 pulley. The sheath is then laid back without suturing, the tourniquet released and haemostasis achieved. It is generally quicker to close the skin in a bloodless field so the tourniquet is re-applied and the skin sutured. If the tendons have been cut in finger flexion, the cut ends will be distal to the wound of the sheath with the finger in extension and will only become apparent at this wound on flexion of the finger. As the practicalities of performing repair require that the finger be straight, or nearly straight, the sheath needs be opened at the level of the distal tendon ends in the extended finger position. Therefore, the Bruner skin incision is extended distally until the distal tendon ends are seen inside the sheath. The sheath is opened transversely, then windowed further by lateral longitudinal incisions, as described above. Because the repairs of the two tendons will be at different levels, this sheath opening is often longer than is necessary to repair tendons divided in finger extension. This mostly involves defunctioning of part of the C1 – A3 – C2 part of the pulley system. It is advisable to try to retain as much of this as possible in case the A4 pulley has to be fully vented to achieve full passive mobilization of the repair (see below): distal bowstringing of the profundus tendon will occur if there is no sheath between the distal edge of the A2 pulley and the proximal edge of the A5 pulley. The proximal tendon ends are delivered in the manner described above into the original wound of the tendon sheath. The core sutures are now placed in the proximal tendon ends by passing the sutures through the sheath from the opening at the level of the distal ends so that these sutures can be used to pull the proximal tendon ends distally through the sheath between the original wound and the more distal opening. When the superficialis tendon repair will be deeper than the profundus repair, the superficialis is pulled through the sheath between the two sheath wounds and repaired first. The distal end of the superficialis tendon lies in the distal opening of the sheath and requires no further exposure. To repair the profundus tendon requires exposure of 0.75–1.0 cm of the distal tendon to achieve the lateral passes of the core suture. Where the repair is just proximal to the A4 pulley, this is difficult but can often be achieved by an assistant holding the finger with the PIP joint completely straight and the DIP joint in extreme flexion to deliver the distal end of the tendon from under the A4 pulley. However, sometimes part of the proximal part of the A4 pulley has to be vented laterally to achieve a good bite of the distal profundus tendon end. Because repair is often done with the finger in slight flexion, it is essential in such cases to test that the repair does not snag on the proximal edge of the A4 pulley after completion of the repair, when the DIP joint is fully straightened passively. If need be, further A4 venting laterally is carried out and, occasionally, the whole A4 pulley will have to be divided if the patient is to achieve full active DIP extension. Suture of the flexor tendons is carried out by a variety of methods. Currently, we use two two-strand Kirchmayr/Kessler core sutures of 3/0 Prolene, or 4/0 for smaller tendons, in planes at right angles to each other , with the sutures tied using a single knot between the tendon ends, as described by Tajima, and a simple circumferential suture of 6/0 or 5/0 Prolene or Nylon for finger tendons. For all core sutures, we prefer to use Prolene, as opposed to braided, sutures as it can be pulled through the tendon more easily when inserted in the complicated manner of a Kessler suture. The memory of Prolene is not a particular problem at the gauges used for core sutures but is more of a nuisance at the finer gauges used for circumferential sutures and some of us prefer to use nylon for these for this reason. Our suture uses and configurations for repair of the FPL tendon have varied considerably because this tendon has been our tool for research into flexor tendon rupture during early mobilisation. Currently, the FPL tendon is repaired using the same suture materials but using two Kessler sutures inserted into the tendon ends at right angles to each other and with both knotted with a single knot between the tendon ends. The simpler of the two circumferential sutures described and illustrated in 1993 by Silfverskiöld and Andersson is then used to complete these repairs. In all digits, when the tendon division is so close to the distal phalanx that it is impossible to insert a Kessler suture into the distal tendon end, we attach the proximal tendon, through the distal stump and without excising this, to the bone of the distal phalanx. This is carried out by a technique which we described several years ago in which the two strands of the Kessler repair are passed up the lateral sides of the distal phalanx, then one strand is passed through a drill-hole in the tuft of the distal phalanx and knotted to the other strand, after exposure of the distal phalangeal tuft through a fish-mouth incision close to the nail at the tip of the digit. This technique of tendon to bone suture avoids the need for a button on the nail and is considerably cheaper than using bone tags. 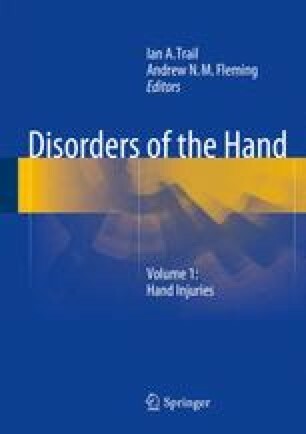 Immediate post-operative management is by dorsal splinting the hand and the mid-forearm to just beyond the finger-tips. This splint is set with the wrist at 20° of flexion, the MCP joints at 40° of flexion and the interphalangeal joints straight. The hand is elevated overnight. The following morning, dressings on the palmar aspect of the hand and fingers are removed and mobilisation started. Where the luxury of thermoplastic splints is possible, this is more comfortable for 5 weeks than plaster of Paris and the thermoplastic splint is fitted as soon as possible. However, a thermoplastic splint is not essential. A plaster of Paris slab is more likely to last for 5 weeks if it is made with fifteen or more layers of plaster and is ribbed along its dorsal surface to achieve the same strengthening as corrugation of a roof. If the distal end of the slab, lying free beyond the palm and unbandaged to the fingers (to allow finger flexion) is wrapped in bandage, this will also help preserve the plaster for the full period of early active mobilisation.